Hi, my name is Chad and I’m an addict. It’s true and my addiction is …. magazines. The glossier the better. I love ’em. I get near a magazine rack and I’m helpless. Photo magazines, running magazines, golf magazines. During one bender, I even picked up a Log Home Living magazine. Even today, it’s hard to talk about. for me, a trip to Wegman’s takes four or five hours – two minutes to pick up the Gatorade and the rest of the time strolling the row of mags. CQ, Vanity Fair, Sports Illustrated, Time, Newsweek. So why the hell am I telling you. 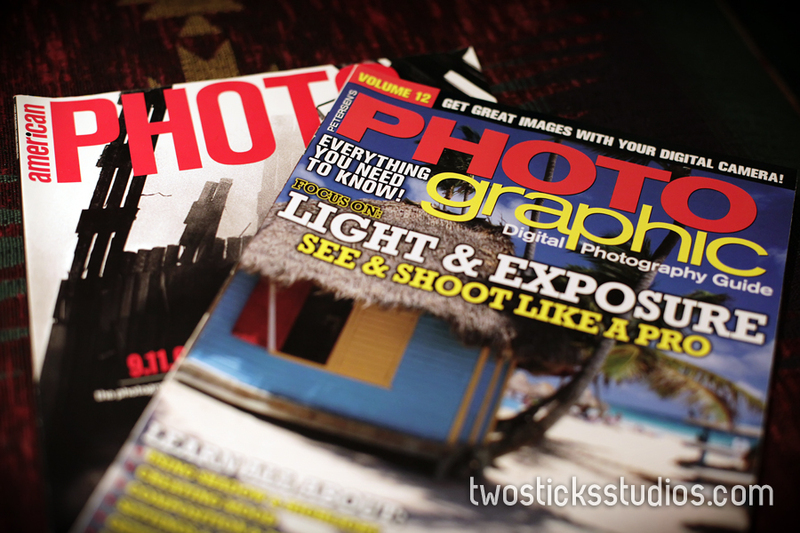 Because I learned a lot about photography through reading these magazines. Don’t get me wrong, nothing replaces picking up your camera every day and going out to shoot something. But if you want to get a better understanding of the basics, learn some lighting setups, stay current on the latest trends, grab a photo magazine. I swear it helps. I have to admit, I’ve been ditching the photo mags lately for something else. I’m sure I’ll take some crap for it, but I’ve been looking at fashion magazines, and believe me I’ve gotten some looks standing in the aisle at the store thumbing through “W.” I have a good reason – at least I think I do. I want to see what the best fashion photographers in the world are doing because you’d be surprised how well some of their lighting techniques and posing translates to brides. They provide just a ton of new ideas to try out. Some work, some don’t but it keeps our work fresh and current and that’s something I think our clients can appreciate. Now, if I can just get Bob to admit he has an addiction to photography videos, we can start him on the 12 steps. Maybe next week.